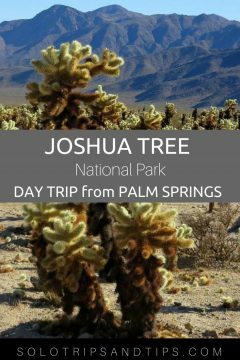 Plan on making a day trip to Joshua Tree National Park while visiting Palm Springs and enjoy some easy hikes and scenic drives. You can really do a lot in one day at Joshua Tree. But I loved it so much that I visited two times, on December 13th and December 25th. Yes, Christmas day is the perfect day for a Joshua Tree hiking trip! This could be the start of a great new holiday tradition. 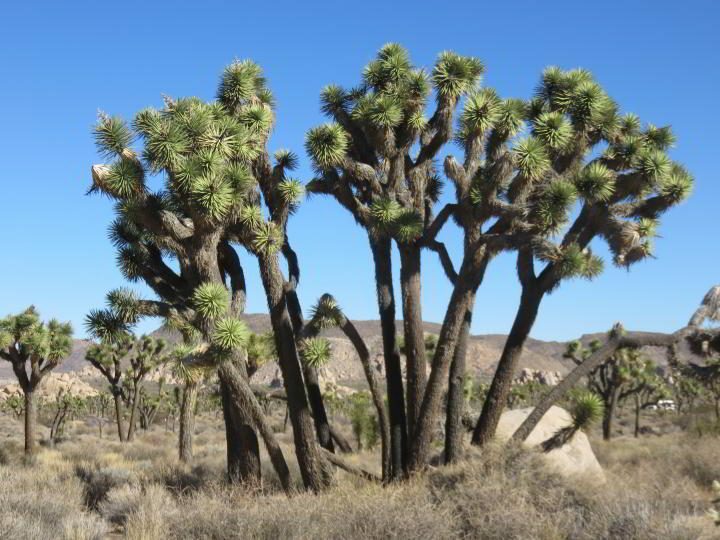 This post is a mini Joshua Tree guide to help you plan your Joshua Tree day trip. Many people have told me that the day trip from Palm Springs to Joshua Tree was their favorite outing in the area. How far is Joshua Tree from Palm Springs? The drive from Palm Springs to Joshua Tree takes from 45 minutes to an hour depending on which entrance you go through. 38 miles from Palm Springs. Off of Hwy 62 in 29 Palms, watch for the signs. 50 miles from Palm Springs. 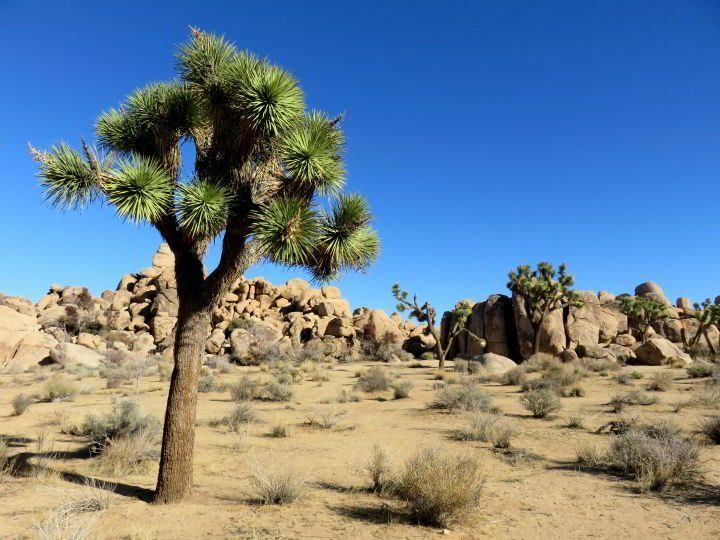 Visiting Joshua Tree National Park is definitely one of the top things to do in and around Palm Springs. I made a pit stop at the Joshua Tree National Park Visitor Center, located 6 miles before the west entrance. You can pick up the National Park Service guide and brochure for the park at the visitor center so you can plan your own Joshua Tree hiking trips. The brochure includes hiking trail descriptions along with a map of the park. 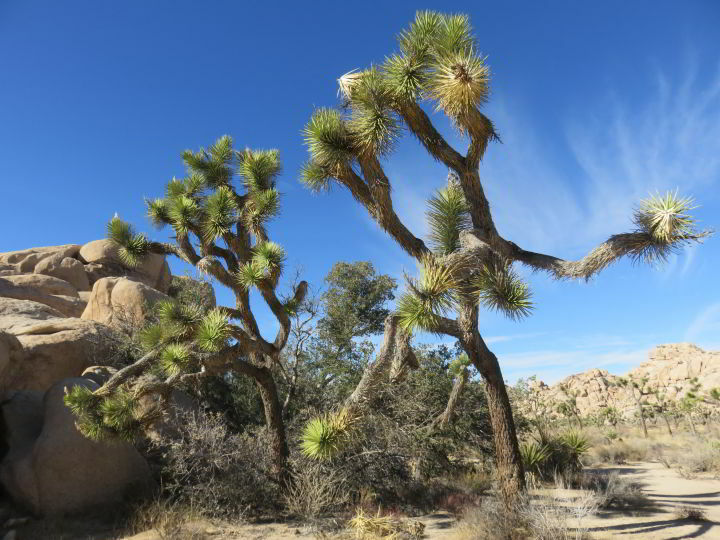 Park rangers are available to help you plan your day visiting Joshua Tree. 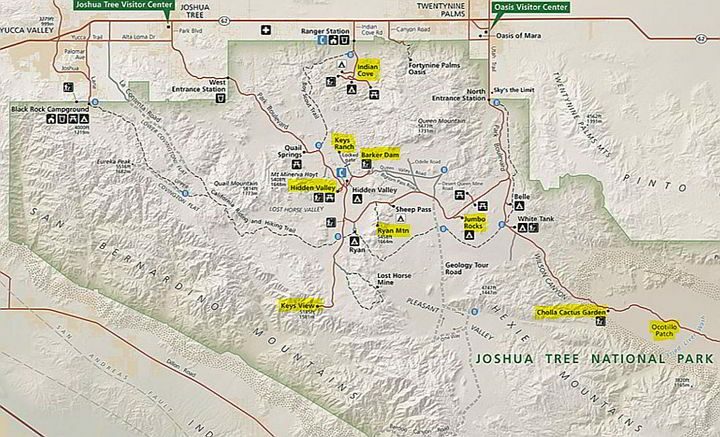 They can give you info on what to do in Joshua Tree such as hiking trails, campgrounds, points of interest, scenic drives, etc. I watched a video at the visitor center. It was maybe 20 minutes, and it was okay but not highly recommended, maybe 3 stars if I were to give it a rating. Note: During the federal government shutdown the shuttle bus service is not operating. Something new in 2018 and continuing through spring 2019 is the pilot program for a shuttle service in Joshua Tree called the Roadrunner. The shuttle bus is free and allows riders free admittance to the park. 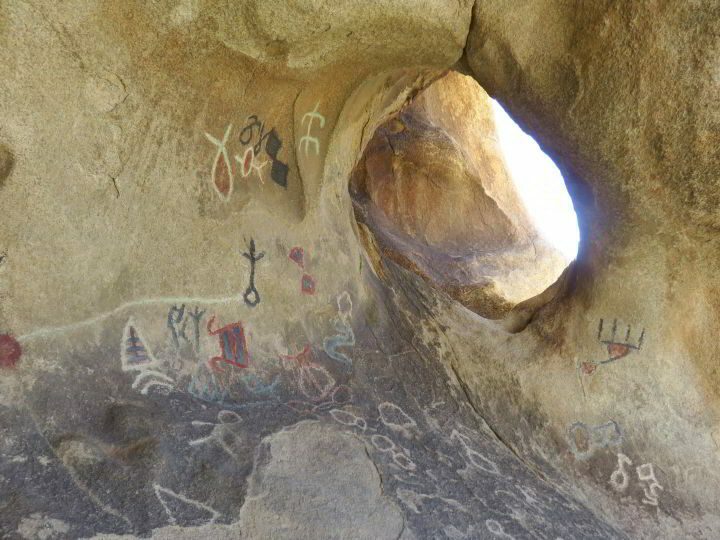 This shuttle service will run through the northern section of Joshua Tree. Remember to bring water with you because there is no water available in the park. Also bring snacks or picnic lunch, sunscreen and/or hat, layered clothing, your camera, day bag or backpack so it’s easy to carry everything. Also remember to grab a map at the visitor center because there isn’t any cell phone service in the park. Friday/Saturday/Sunday plus every day from December 21 to January 6. Also Monday January 21 and Monday February 18. The free shuttle bus will run daily starting around 8 am. First shuttle bus leaves transit center around 8 am. You can find the full shuttle bus scheduler here. Twentynine Palms Transit Center – free parking available. Oasis Visitor Center – there is free street parking near the visitor center stop. Driving around the park there are several pull-outs where you can park and go for a wander to take in the scenery. You’ll want to be prepared for the weather at Joshua Tree. 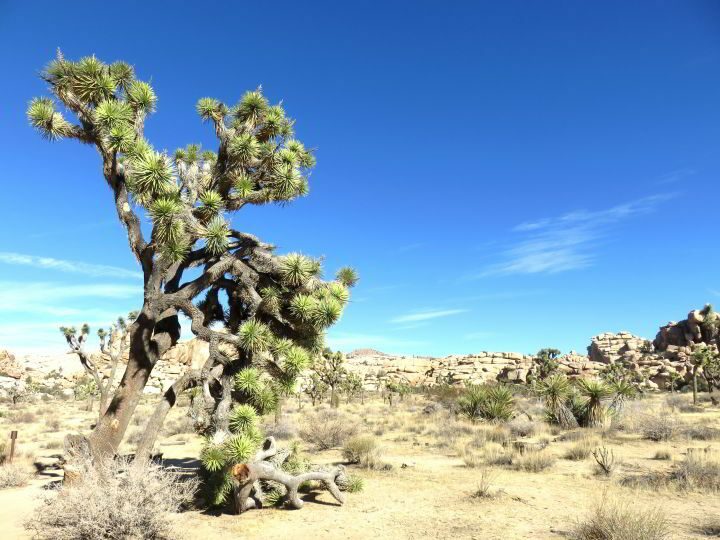 It can get cold and extremely windy at Joshua Tree in winter (and excessively hot during summer) so check the weather forecast from the National Weather Service before you leave for Joshua Tree. You will find a weather link on the National Park Service page here. 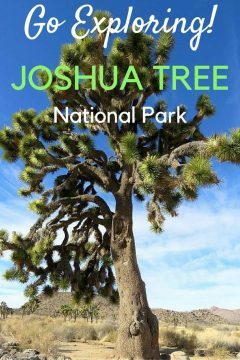 The NPS website is a great resource for researching and planning a Joshua Tree trip or any other national park in the USA. Where else will you find two deserts in one National Park? 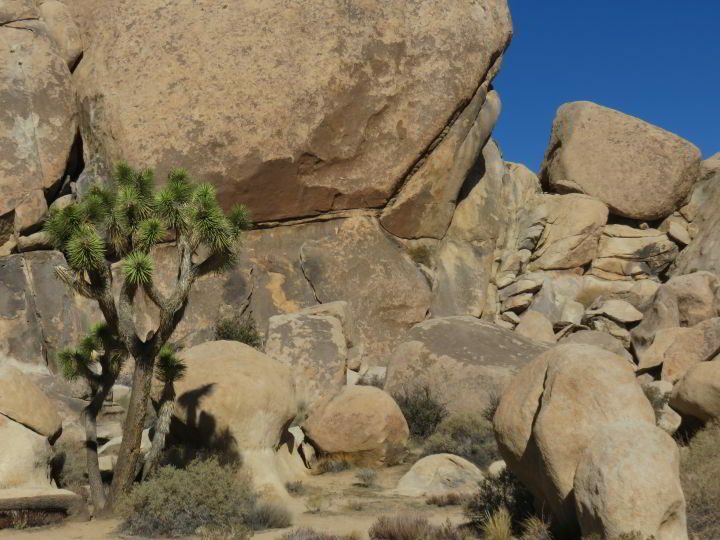 You’ll see the difference on the Joshua Tree National Park hiking trails and while you drive through the park. 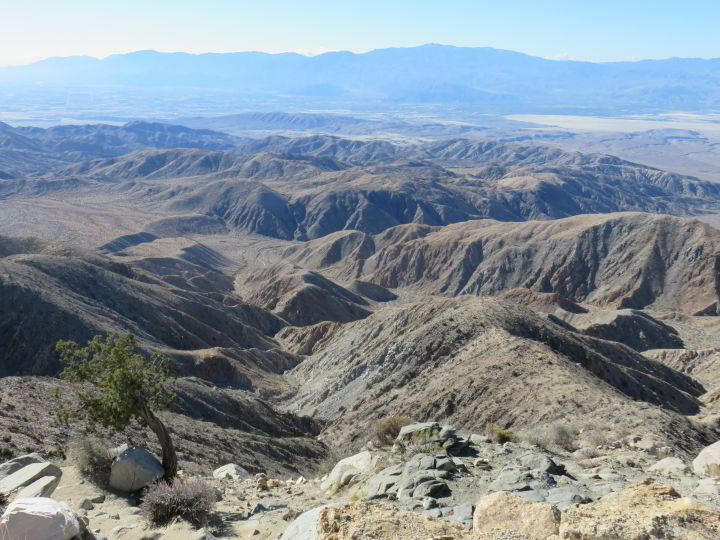 The western portion of Joshua Tree National Park, above 3,000 ft elevation is part of the Mojave Desert. The eastern half of the park lies within the Colorado Desert, with elevations below 3,000 ft.
You will find the Joshua trees in the Mojave Desert but not in the lower elevations of the Colorado Desert which is part of the Sonoran Desert. 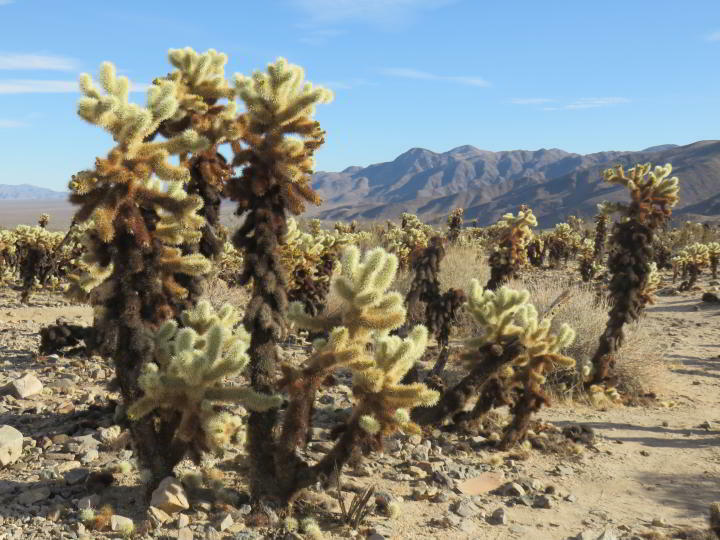 The cholla cactus garden and the ocotillo patch are located in the eastern part of the park and definitely worth the drive. 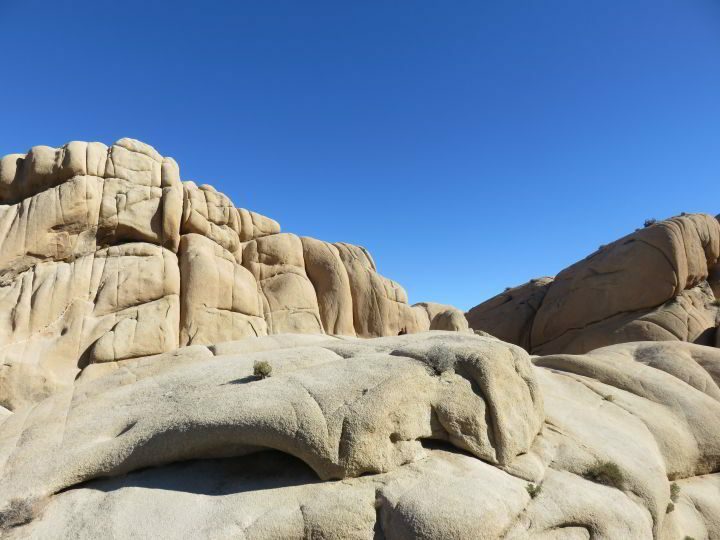 Here are some of the best hikes at Joshua Tree, they are all easy to moderate difficulty. Remember to bring your refillable water bottle with you while hiking in the desert. On my first visit to go hiking at Joshua Tree National Park I walked both the Hidden Valley and Barker Dam nature trails. Each hike takes about 1-hour round-trip. There are picnic benches and restrooms near the parking area of both hikes. 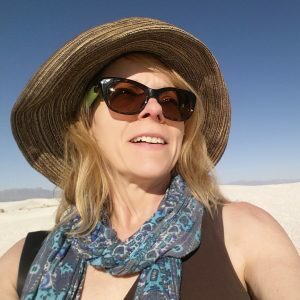 These are popular hikes at Joshua Tree and I enjoyed both. By mid-day the winds picked up and I decided to drive to the eastern half of the park. Driving along the boulders from Ryan Mountain to Jumbo Rocks is a scenic route with several places to stop and park. In winter time during afternoon hours Joshua Tree National Park gets busier and parking spots fill up. There is room to park along the road at some of the most popular points of interest such as Skull Rock. I stopped at Cap Rock for a stroll along the marked pathway. There are interesting boulder formations on the short walk. Next stop was Jumbo Rocks. Standing among the boulders near a campsite, a young man inquired if anyone had seen a tent at the site. Evidently the winds had carried the tent away during the night. The owners opted to stay at alternate accommodations one night and the tent was left without much to weigh it down. After a few minutes of searching the tent was retrieved, several meters from its original location. So now you know, tie down your tent down at Joshua Tree. Driving to the Cottonwood Visitor Center I enjoyed the scenery and did not plan on getting out in the wind again. Then I saw the cholla cactus, also known by the common name teddy-bear cholla, and I had to stop. Cholla cactus garden is one of my favorite places to stop in Joshua Tree. Taking in the mountain views surrounded by teddy bear cholla, a most memorable Joshua Tree Christmas day. Cacti arms stretched out to greet me with a warm hug. Just kidding. If you hug a teddy-bear cholla you will remember it forever, in agony. The cacti spines have barbs that are difficult, and painful to remove once embedded into the skin. I had planned to get to the Cottonwood Visitor Center by 2 pm for a ranger talk but my stop at the cholla cactus garden kept me until after 3 pm. I drove past the ocotillo patch without stopping. 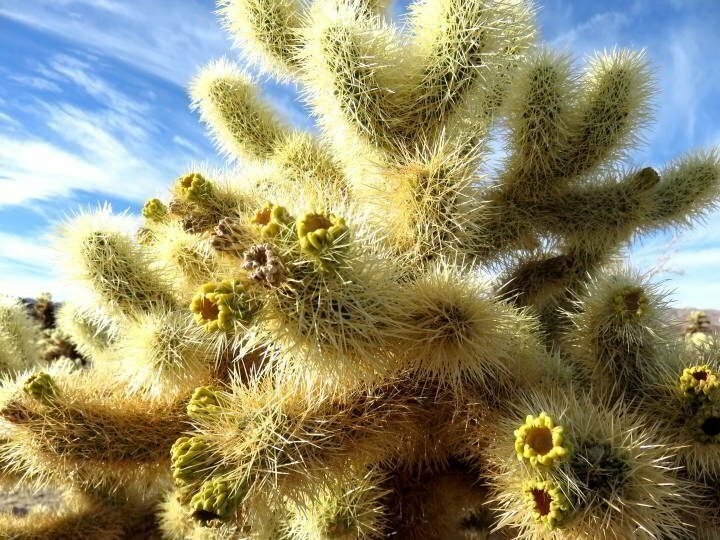 A closer look at the cholla cactus. 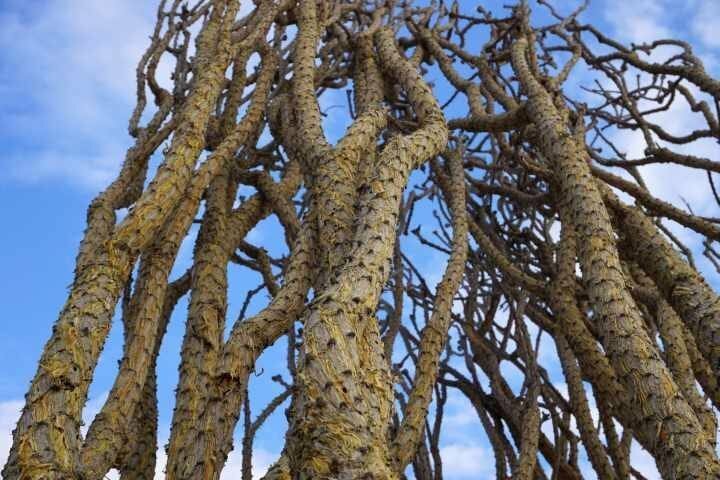 Visiting Big Bend National Park and in Tucson I saw ocotillo surrounded by magnificent views. The ocotillo patch in Joshua Tree National Park was not so impressive in December but definitely worth a stop if you have not seen the ocotillo plant before. I would love to visit again to see the ocotillo plants while in bloom. On my Christmas day visit to Joshua Tree National Park the weather was cooler and windy. I wore layered clothing but could have used some extra warmth or at least a windbreaker jacket. Keys View was especially cold and windy but the panoramic view was majestic at 5185 ft (1581 m) and definitely worth the short drive. While you are in Palm Springs I also recommend going to Mount San Jacinto State Park. You can take the tram to go from desert to mountains and do some hiking in the park. You can get to Joshua Tree National Park via I-10 to the South Entrance or take Twentynine Palms Highway (Hwy 62) to the West or North Entrance. If you have more time you can arrange to stay at a campsite in Joshua Tree National Park. Contact the National Park Service website to reserve a camping spot in the park. Note: Drones are not allowed at Joshua Tree National Park. But you can hike or climb to a great viewing point to get stunning photos of your visit.